I was excited to see Kate was finally available for firmware 2.0 via the Installer. It is a public beta version of the application. I personally am a huge fan of Kate and really miss the features that I use it for. However, when I try to install the app, I get an error. The error says, “Failed script command on line 2: ChangeMode.” Then my iPhone crashed back to the SpringBoard. I was totally bummed…I was looking forward to checking it out. Let me know in the comments if you are getting the same error. Update:: Below is a list of features that Kate 2.0b4 has. I do think that it is cool that if you previously registered the app, it will carry over to this version of Kate. • First public beta for firmware 2.0. Can be installed from the repository http://i.ripdev.com/ using Installer 4. 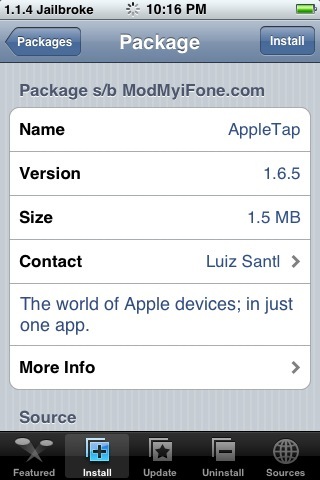 • All included components reworked to work under 2.0.x with the same functionality. We will expand on the featureset soon. • Existing subscriptions will work; you can also request a trial or check your subscription by visiting Settings > RiP Dev > RiP Dev Products preference pane. 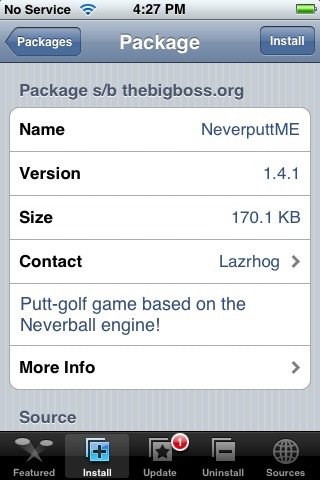 NeverputtME is a game that has been out for a little while now via Installer…for firmware 1.1.4 and below. It is a putting game, created by Lazrhog, that is based on the Neverball engine. I actually tested this game when it first came out however, like Neverball, it is impossible to get screenshots of the application. Well, we finally got some screenshots! So, time for a review! When you open NeverputtME, you will get the info screen where you will get a little bit of information about the app. To get to the Main Menu of the app, select the Play option in the upper left corner. I’m going through the forum, which I would love to have more time for, and I found this thread stated by DJContagious. It explains how to take a YouTube Video and make it into a video ringtone. How sweet is that! Great job DJContagious! 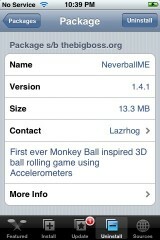 The update to version 1.4.1 of Neverball change the name of the application to NeverballME. BigBoss also mentioned that, “The main changes here are to update the data files used to allow for NeverPutt.” It does feel like the app plays a little smoother as well. 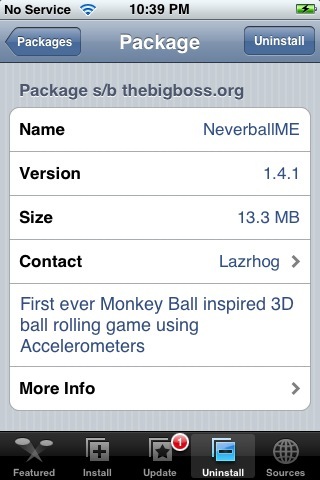 You can get NeverballME though the BigBoss source. 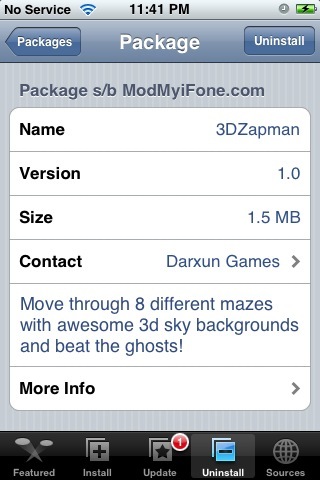 3DZapman is basically a 3D version of PacMan. When you open the application, you will get a splash screen and then the info screen. The info screen will give you your device ID and a place to enter your unlock code if you decide to purchase the full app. The full version of the application is $6.99 USD. However, you can play a demo of the app by selecting the Demo option in the lower right corner. The demo version is restricted to one level and has a time limit. Once you have select Demo, you will then get a screen with the options; Start Game, Options and Credits. In the Options you have the ability to turn on/off the background and music. You can also adjust the volume of the sound affects. To get back to the main menu, select Back. When you select Start Game, you will be brought to the main play screen. “In this video the controlpad screen in the bottom portion of the screen is not included. The initial release of quake4iphone will have similar controls to the Gameboy Advance emulator gpSPhone in portrait mode. Using the accelerometer is being considered for upcoming versions, if the demand is there. I did include network play in this port, and allow for the command line interface to be used. As firmware 1.2.0 is emerging, I must note I currently am in the process of organizing my code to update to it, including quake4iphone. The update to version 3.5 of Tetris! and PenguinPanic make the same changes to both applications. On the main intro screen, the Start and Donate button are now larger and have a nicer design. Also, once you have won (or lost) a game, you are now able to submit your score to an online High Scores database. 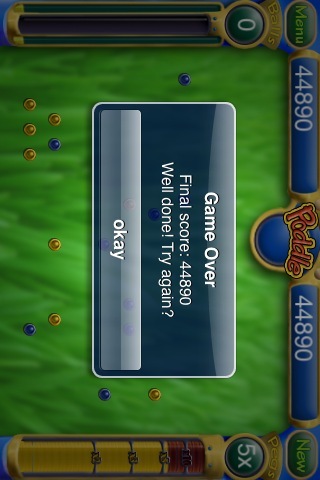 I personally am a big fan of High Scores!! 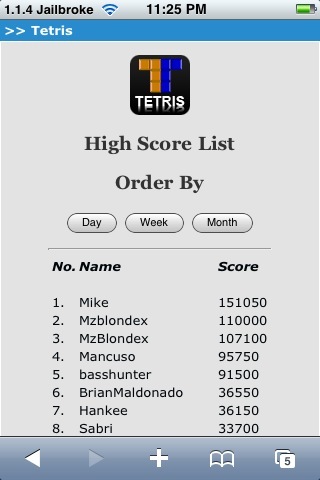 If you choose to submit your score it will open a web browser with the High Score list. The list automatically displays the top 25 scores but, you can continue to load 25 more. You can also sort the High Scores by Day, Week or Month. Both Tetris! and PenguinPanic are available through the BigBoss source. Below are the screenshots. Filed Under: BigBoss, Games, Installer, Penguin Panic!, Tetris!, updates Tagged With: BigBoss, iPhone, iPod touch, PenguinPanic, Tetris! There is a new SummerBoard theme available in the Installer. The theme itself isn’t actually new, it came out a few days ago but I never had a chance to write about it. The theme is based off the iPhone 3G and includes quite a few icons (these are the times when I wish my iPhone 3G was jailbroken!). You can get the iPhone 3G Themes from the iSpazio source. The update to Neverball 1.1 adds a very important new feature to the main menu; Settings. In the settings you can set the calibration of the app. This allows you to choose if you would like that application controls to be tipped forward or back and anywhere in between. 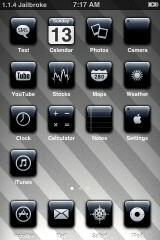 All you do is tip your iPhone and when you have it where you want it, select Calibrate Center. This will change the angle at which the game is played. Then select back and go into the application. this makes the application sooooo much easier to play. I actually really enjoy this game now! The only other change I noticed was that when you are in a level, the goal doesn’t light up until you have collected enough coins. I think in the previous version it was lite up all the time. 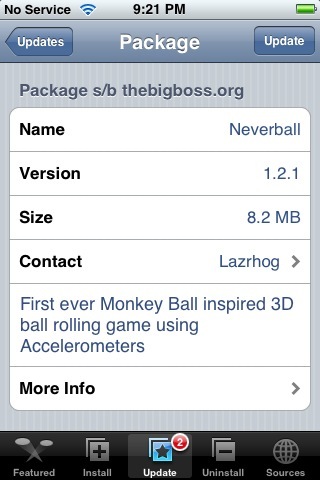 You can get Neverball through the BigBoss source. Note: I couldn’t get screenshots of the new feature because you can not take screenshots of this application.